This weekend I did something I’ve never done before..
No, I went camping and tubing. On July 4th, Special K had a cookout. While there, some of her friends started planning a camping trip and invited us.. they assured me that if I refused.. I would die. And, well, I wanna live forever.. so I agreed. Now mind you, I’m a city boy. Born and raised in a congested metropolis and quite content with it. The only pictures I have in my head of camping are what I’ve seen from dozens of horror flicks, and of course, deliverance. That, coupled with the idea of being eaten alive by bugs and being without toilets, showers, and, most importantly, INTERNET are more than enough to keep me from ever desiring to do such a thing. So why did you do it? You really think they’d kill you? Well, you know my definition of life: “Life is the collection of experiences between birth and death”. That’s why I did it.. to add another experience to my collection. It was only for a couple days, if I didn’t like it at least I would KNOW that it’s not for me and never do it again. You know, I did. Early Friday morning, the six of us took off towards Valentine, Nebraska, stopping in Norfolk, Nebraska to pick up a camper. We arrived about 7 hours later.. just as it was starting to darken. It was surprisingly vacant, which was nice. We could hear the water flowing beside us, which is probably why everyone kept peeing so damned much.. although it could have been the beer? We started a fire and grilled some burgers.. after which we sat around discussing utility bills.. wtf? The next morning we were up bright and early, a bus came and picked us up and took us to the start point of our tubing experience. A 30 minute drive would take us towards a 5 hour float back. With 6 tubes tied together, and 2 smaller tubes carrying our coolers full o’ beer, we set off down the river. We could not have asked for more perfect weather. It wasn’t too hot, nor too cold. The water was perfect.. it was all just right. We started down the river on a very peaceful, relaxing 5-hour float. It was fairly uneventful with the exception of one member who had issues staying on his tube.. we affectionately named him “Shamu”. Once we arrived back at camp, we started a fire and grilled out again, then we all pretty much collapsed after a day of non-stop drinking. The next morning we packed up and hit the road towards home. Sounds like a lot of work for just 1 day. Yes indeed.. I’m still pretty stiff… huhhuh.. from driving so much. So you’d do it again, then? Um.. 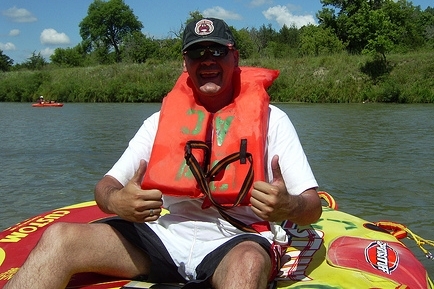 I really enjoyed the tubing experience. I’m certain there’s a closer place where I can do that again.. if so, yea.. I’d do that again. The camping part? I love my showers too much.. so next time I’d need a place to shower or maybe just one night instead of two. ..and again, less than 7 hours away.. unless it’s someplace cool like a mountain in Colorado.